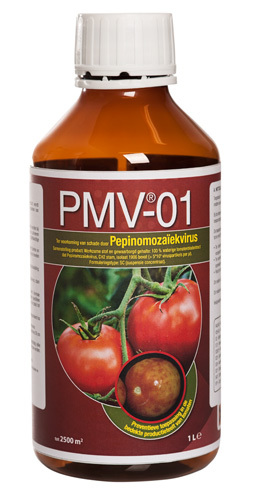 PMV®-01 is a vaccination strategy that has been used since 2011 in greenhouse tomato cultivation to offer protection against the highly infectious Pepino mosaic virus (PepMV). This vaccination strategy offers a sustainable and biological way to avoid serious quality and production losses caused by PepMV. PMV®-01 is the result of 10 years of scientific research in Belgium, the Netherlands and Spain. This research showed that the best protection against PepMV was achieved with a vaccination strategy based on a unique, mild and stable Chilean PepMV-isolate. This isolate quickly colonizes the plants and subsequently offers optimal protection against PepMV damage. Based on this knowledge PMV®-01 was developed. The product itself has a certified production process with strict quality controls. But PMV®-01 is more than just a product, it is a strategy. Taking pre- and post-vaccination leaf samples is part of the vaccination strategy. Pre-vaccination samples are taken to check the young plants for a possible PepMV infection before vaccination and post-vaccination samples are taken to confirm a successful installation of the vaccine. PMV®-01 is authorized for use as a biological plant protection product in the majority of the European member states and in a handful of countries outside the European Union. This number will be increasing in the near future. Currently, several evaluations procedures are in progress, both in- and outside Europe. Since its very first use, a total surface of more than 4500 ha has been treated with PMV-01. What is Pepino mosaic virus? Pepino mosaic virus (PepMV) is a single-stranded RNA-virus (Potexvirus genus, Fexiviridae family) that was originally isolated from pepino (Solanum muricatum), a South American melon-like fruit. From the season 1999-2000 the virus started to damage greenhouse tomato crops in Europe. 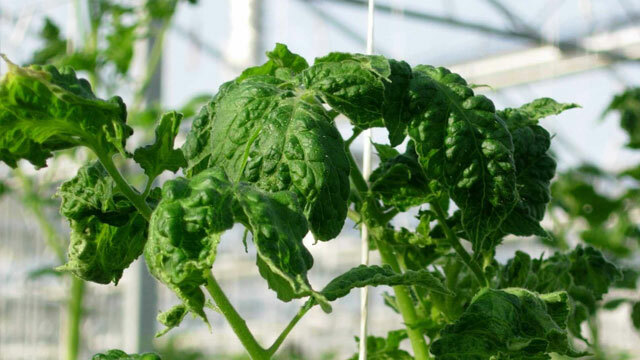 Although the virus only causes major problems in tomato cultivation, other plants of the Solanaceae family (night shade family) such as eggplant, black nightshade, some potato and pepper varieties and some plants belonging to the genera Nicotiana (e.g. tobacco plant), Datura (e.g. thorn apple) and Physalis (e.g. Physalis floridana) can also act as a host. The virus is very infectious and is transmitted mechanically. Possible ways of mechanical transmission are tools, employees, visitors, mobile phones, insects, etc. In other words, all means by which plant sap of an infected plant gets in contact with a non-infected plant. As soon as one single plant in the greenhouse has been infected by the virus, it is impossible to protect the other greenhouse plants from infection because of the rapid spread of the virus. Moreover, the virus spreads heterogeneously, which makes it very difficult to control the crop. 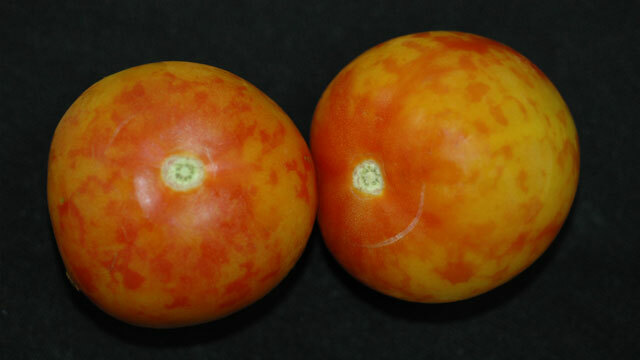 The most typical symptom of a PepMV infection is marbling of the tomato fruit. Brown sepals, bright yellow spots on the leaves and nettle-heads are also characteristic PepMV symptoms. In addition to these typical symptoms, some damage profiles with a physiological cause, such as flamed fruits or open fruits, can also be enhanced by the presence of PepMV. Because PepMV is a RNA-virus, the replication process in the plant cell proceeds in a less controlled way and mutations occur regularly. The yellowing mutant and the necrotic mutant for example are two atypical forms caused by a mutation in the viral genetic material. Both mutants can cause severe damage to the crop. Four different strains of the virus are known: the Chilean strain (CH2), the European strain (EU), the Peruvian strain (LP) and the American strain (US1). Within these strains, many different individuals, called isolates, can be observed. In Europe, the Chilean strain (CH2) is dominant and present in 90% of the infections. If more strains are found in case of infection, the infection is usually more aggressive than when only one single strain is present. Within the strains, however, there is also variability among different isolates belonging to the same strain. Although different isolates within one and the same strain are genetically very similar, they can show very different levels of aggressiveness in the plant and, as a consequence, in the severity of the symptoms and the damage they cause. For example, there are very aggressive Chilean isolates, but also very mild ones that cause less symptoms. 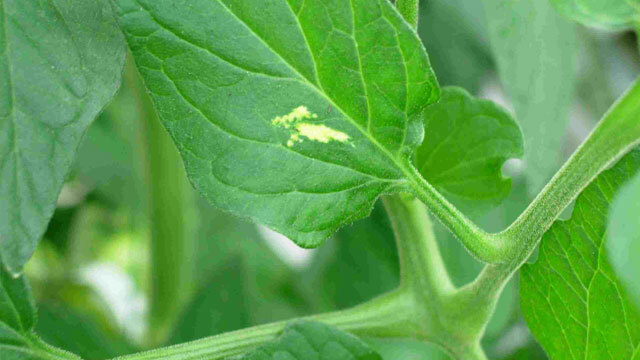 The impact of a PepMV infection for the tomato grower is variable. Based on a survey among Belgian growers and on several practical trials with various isolates of PepMV, quality losses were estimated to be between 4 and 15%, with additional production losses between 4 and 12%. Several factors contribute to this variability. The genetic identity of the virus – which isolate of which strain – that causes the infection is one them. The moment in the crop cycle when the infection takes place is another factor that might have an important impact on the damage that is caused. 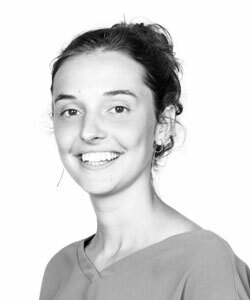 For instance, an infection early in the season, when the plant does not yet bear fruit, will typically cause less losses than when the infection takes place when the plants are heavily laden. Typical of the damage caused by PepMV is, that it is very intense for a few weeks and then disappears to eventually return later in the season. 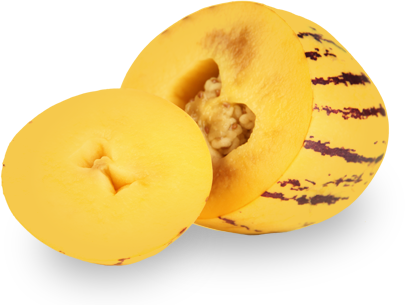 This means that damage can be more severe during a certain period of the year, with 50-60% non-marketable fruits. Moreover, some tomato varieties are more susceptible to quality losses due to PepMV than others and climate also has an impact. In general, when a plant has more stress for whatever reason, losses will be much greater. In the early 2000s, PepMV became such a huge problem in Belgium and the Netherlands, that there was an urgent demand for support and control measures from the tomato sector. As a first step, fundamental research was carried out to identify the problem and a very strict hygiene protocol was developed to avoid PepMV infections. These strict hygiene measures turned out to be insufficient to ensure the grower a PepMV-free crop. Soon, research was oriented towards concrete, biological management tools and step by step PMV®-01 vaccination strategy was developed to immunize plants in order to prevent infection. Before starting PMV®-01 vaccination, a team of experts will provide to the customer detailed information about the sampling and the vaccination itself. During this meeting the various stages of the crop cycle will be discussed with the grower in order to identify the points that require special attention with regard to hygiene measures. 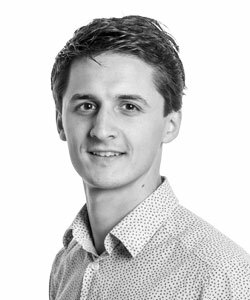 Based on this information, the team of experts can then provide the grower with a tailor-made advice on hygiene measures. These measures are taken to guarantee an optimal vaccination, but they can also be important for the grower to protect his crops against all kinds of other infections. The next step of the vaccination strategy consists of a pre-vaccination sampling. The samples are taken no earlier than 1 week before planting. Depending on the grower’s preference, they can be taken at the plant nursery or at the grower’s place. The leaf samples are sent to the laboratory of Scientia Terrae VZW for molecular analysis in order to check if the plants are free of PepMV. The result of this analysis can be expected within 3 working days after arrival at the laboratory. Tomato plants are grown with great care and are usually free of PepMV. As soon as this is confirmed by the sampling and the accompanying analysis, the vaccination procedure can be started. If the samples do test positive for PepMV, further options will be discussed with the customer. For optimum results, it is recommended to vaccinate as soon as possible after planting. The vaccination itself consists of one treatment with 4 to 8 L of PMV®-01/ha diluted in 150 to 300L water at a spraying pressure of 5 to 7 bar. In order to guarantee optimum effectiveness, the temperature of the product should never exceed 15°C during treatment. After vaccination, a crop treatment is recommended so that the vaccine can easily and quickly penetrate the plant. 4L/ha is considered to be the standard dose for an optimum effect and a sufficiently rapid colonization. In case of a high risk of contamination and the need for accelerated colonization, the dose may be increased to 8 L/ha. The vaccine finally installs itself in the plants. After an incubation period of 4 to 6 weeks, the crop is protected against damage caused by PepMV for the entire growing season. During this period, the team of experts will take post-vaccination samples to confirm the successful installation of the vaccine. Provide detailed information about hygienic measures, sampling and vaccination. Pre-vaccination samples are taken to check if the plants are free of PepMV. Vaccination of the plants after planting by spraying 4-8 L of PMV®-01/ha diluted in 150-300 L water. Post-vaccination samples are taken to confirm the successful installation of the vaccine. The PMV®-01 vaccination strategy is based on the principle of cross-protection, a well-known mechanism in plant virology. 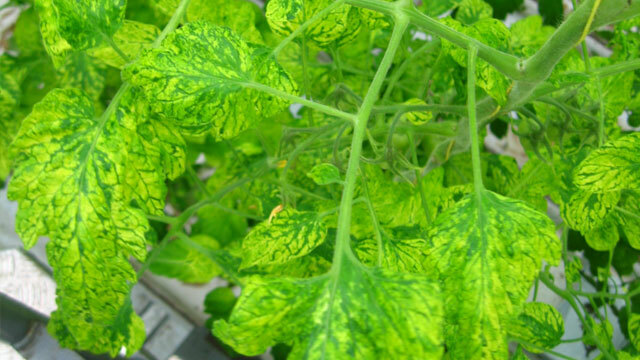 At a first infection with the Pepino Mosaic Virus, the plant’s immune system is activated. Afterwards when the plant gets into contact again with the same virus , the plant’s immune system recognizes the virus and goes into action. As a result, the virus that causes the infection pressure will be eliminated by the plant itself. The higher the level of genetic similarity between the virus causing the first infection and the virus causing the infection pressure afterwards, the more efficiently the mechanism will work. The active substance of PMV®-01 contains a mild isolate of the Chilean PepMV strain. This mild and stable Chilean isolate quickly installs itself in all the parts of the plant, so that the immune system will be activated in the entire crop 4 to 6 weeks after vaccination. After this period the plant is protected against future attacks of aggressive PepMV-isolates. Moreover, the mild isolate causes no symptoms on the fruits and has no effect on production, nor on quality. 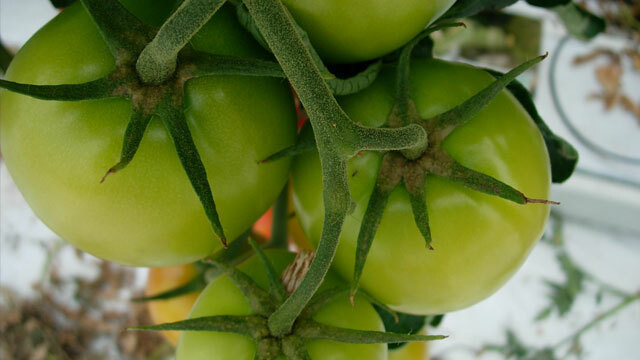 Why do tomato growers choose for PMV®-01? The main reason why tomato growers use PMV®-01 is that PMV®-01 has proven to be an excellent solution for PepMV problems. 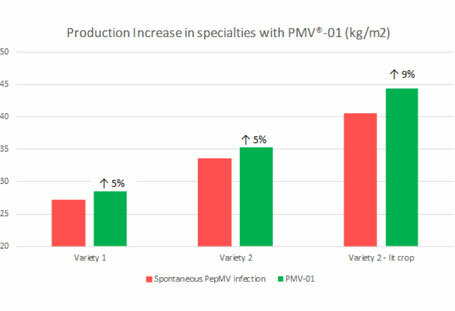 Quality and production losses due to PepMV can be avoided after vaccination with PMV®-01. Strict quality controls during the production process guarantee the excellent effect of PMV®-01 and the accurate support of our vaccination experts ensures a correct implementation of the vaccination strategy. Where can PMV®-01 be used? 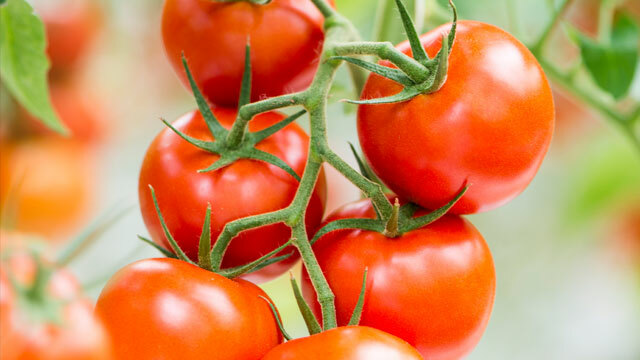 PMV®-01 is officially authorized for use as a biological plant protection product against PepMV in 14 EU member states, including the main tomato producing countries, and in Morocco. Ten years of scientific research and six years of commercial experience in more than 4500 treated hectares, have proven that PMV®-01 is a reliable solution for PepMV damage in all types of tomatoes, ranging from the smallest specialties to big beef tomatoes, in cultivation systems both with and without assimilation lighting, in all substrate and soil types and in different climatological conditions. 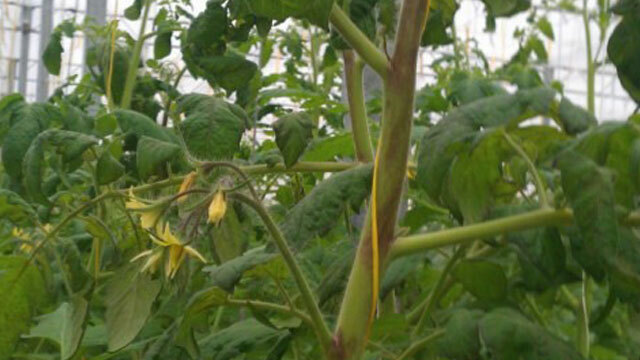 The typical PepMV symptoms are not seen in PMV®-01 protected tomato crops. Moreover, production losses of 4 to 12% that can be caused by an aggressive PepMV infection are avoided with a PMV®-01 vaccination. The effectiveness has been shown in a series of official GEP trials. 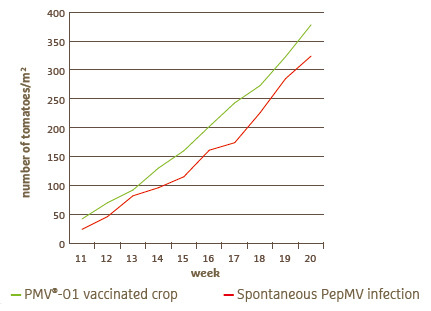 In these trials, crops with and without PMV®-01 vaccination were inoculated with an aggressive PepMV isolate three weeks after the vaccination date. The PMV®-01 vaccinated crops showed no loss of quality and production, whereas the non-vaccinated crops showed average production losses ranging from 7 to 11%. PMV®-01 vaccinated and non-vaccinated crops were inoculated with an aggressive PepMV isolate 3 weeks after the vaccination date. 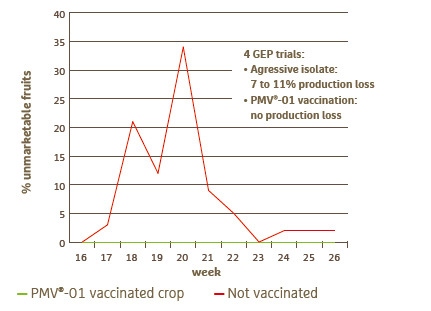 The PMV®-01 vaccinated crops showed no loss of quality and production in all GEP trials performed. In these 4 GEP trials, the non-vaccinated crops showed average production losses ranging from 7 to 11%. GEP: Good Experimental Practice. In addition to the official trials, the production data of several commercial growers have been compared. The grower in the following example continually obtains higher yields of specialty tomatoes after PMV®-01 vaccination. Before vaccination, the crop suffered from a spontaneous, aggressive PepMV infection. After PMV®-01 vaccination, the plants were much healthier and more vigorous and their improved vitality resulted in a higher yield. Commercial data from a tomato grower who continually obtains higher yields of specialty tomatoes after PMV®-01 vaccination. Before he used the vaccine, the crop suffered from a spontaneous, aggressive PepMV infection. After PMV®-01 vaccination, the plants showed a faster and more generative growth, resulting in more yield. The highly infectious Pepino Mosaic Virus (PepMV) results in severe damage and economical losses in greenhouse tomato crops. Did you ever think about vaccinating your crop against Pepino Mosaic Virus? You’re invited to visit Greentech, the world’s leading horticulture trade show. Come and visit us at Greentech from 12 untill 14/06/2018 stand T08.104. Use plant protection products safely. Before use, always read the label and product information, including the corresponding risk phrases and hazard symbols.